When I was nine years old, my fiddle teacher sent me to a workshop from the “Famous Fiddlin’ Banjo Billy Mathews.” Having played less than a year and being deathly shy, the workshop was one of the most challenging, terrifying, addicting, and exciting experiences of my life. Billy amazed me: after several cups of coffee and a little grumbling about it being “too early for all this,” he helped a dozen of us learn tune after tune, noticing each note out of place and telling us the stories of where he learned each tune. Between tunes, I loved hearing about over 40 years of travels in which Billy ran the Phippsburg Banjo Company and traveled across the United States selling his banjos, playing with the Skirtlifters band, and collecting tunes. Billy has always been a natural when it comes to learning music by ear. He started playing music at a young age, and as a young adult he moved to Colorado and started building banjos, creating the Phippsburg Banjo Company. When he was 22 he moved to the Ozarks and built his home on a farm in northern Arkansas. 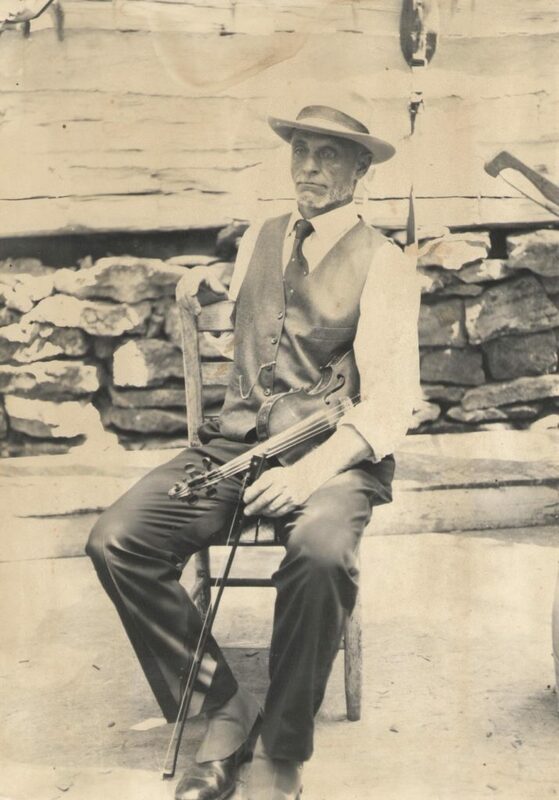 It was here that he raised his children, built banjos, and in his words, “literally dug out a life from the rough, rocky hillside.” Few fiddlers today can claim to have lived as Billy did – to have built their home and farm, to have learned tunes not from recordings but from other musicians, and to have supported themselves and their family by building banjos and playing music. 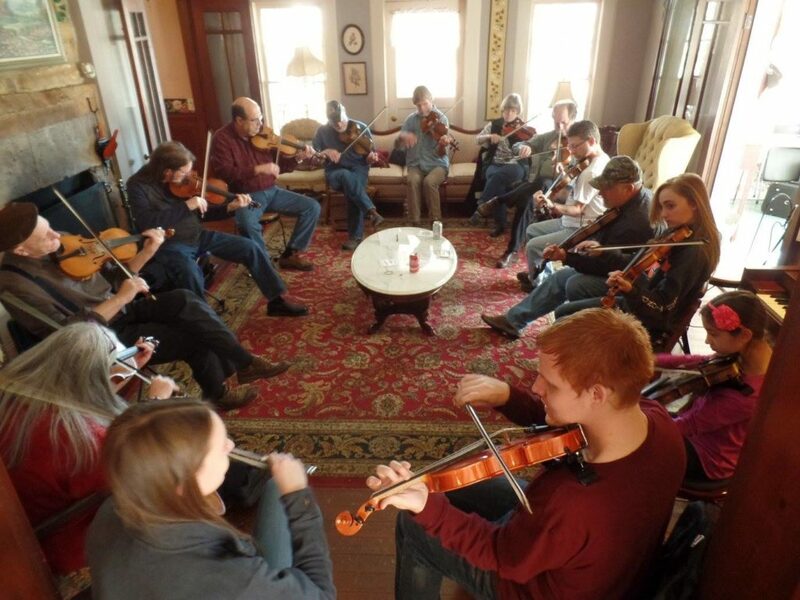 Billy’s workshops in Mountain View are always held at the Inn at Mountain View, a historic bed-and-breakfast near the heart of the nightly music on the town square. For the first few workshops I took, I struggled with the tunes, but I didn’t mind – I was hooked on the music and fascinated by the jams each night. Most folks knew all the tunes being played, which amazed me, with my list of ten tunes I knew by heart. It seemed like they must have played hundreds, one right after another. In the following ten years, I spent countless hours in workshops, jams, and shows where I was fortunate enough to learn from and play with Billy. 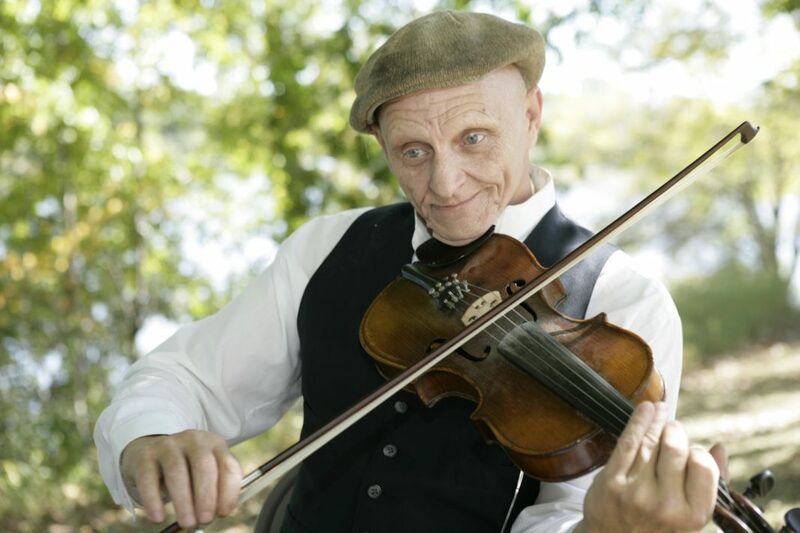 In 2007, Billy began working on a CD set of 500 fiddle tunes. He gave me several of the CDs in my early teens, telling me to “learn all these and come back next year for more tunes.” I learned hundreds of tunes from the workshops and CDs, and upon entering college almost half of the tunes I knew came from Billy and his 500 Fiddle Tunes: Old-Time Archive, which he completed in 2011. I entered the Donaghey Scholars Program, an interdisciplinary honors program at the University of Arkansas at Little Rock in 2014, but I would always drive home when Billy was in town for a workshop or festival weekend. In order to graduate as a Donaghey Scholar, each student is required to complete a final project; these projects solve a problem or fill a need in student’s area of interest. I wanted to combine my major in anthropology with the old-time music community, so I started thinking about what I could do to contribute. 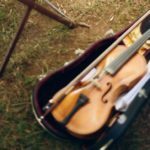 In my experience taking workshops from Billy and other old-time fiddlers, there were usually several students who were not comfortable learning tunes by ear, instead preferring to use sheet music to learn the tune initially. Billy’s plays hundreds of unique tunes, but those who read music are unable to pick up every tune he teaches in a workshop; I suggested to Billy that more people could learn the tunes he played if they were transcribed into a book, and thus our project began. Billy was excited about the idea of turning his 500 tunes into a book from the very beginning. Upon suggesting it, I discovered that he had already discussed and started working on transcriptions with several people, but they had each backed out. I wrote out a dozen tunes to be sure I was capable of transcribing the recordings, then wrote a proposal for the book to be my final project for the Donaghey Scholars Program. With 488 tunes left to go, they approved my proposal, and I started transcribing in earnest. We decided to omit bowing markings and variations from the transcriptions for a number of reasons, including the incredible amount of time it would take to denote bowing accurately. We wanted transcriptions to be detailed enough to capture the authentic way Billy plays the tune while not smothering them in markings. Although there is a time and place for such detail, our priority was simplicity. Billy and I met after I’d transcribed about 50 tunes. In workshops, he had always paid close attention to detail, taking care that each student got even the smallest notes, so I knew that these transcriptions would need Billy’s input and proofreading in order to represent his playing well. Since Billy doesn’t read notation, I played each tune as I had transcribed it, and Billy corrected the notes as I went. At first, there were several corrections to make on each tune, but over time there were few notes, if any, to correct – after all, repeating anything 500 times tends to cut down on mistakes. At this stage, we decided that adding chords to each transcription was worth the time it would take, especially since there is no accompaniment on the 500 Fiddle Tunes recordings. I started adding the chords to each tune as I transcribed them, then Billy would pick up a guitar and play the tunes with me to be sure I got them right. This was perhaps my favorite part of working on the transcriptions; it provided a nice break during our four or five hour stints in which we could simply enjoy playing a few tunes. Billy often stays with his band members Paul and Christine in their home in Illinois, so I visited them for a several weeks to work on the book. Many tunes were fueled by Christine’s cooking, and dinner was always followed by a wonderful session of obscure tunes. I was fortunate enough to tag along with Paul, Christine, and Billy throughout the year at Breaking Up Winter in 2018, where Billy was a presenter, and at the Indiana Fiddler’s Gathering later that summer. After transcribing all 500 tunes and reviewing them with Billy, I laid them out for print in the same order as the 500 Fiddle Tunes CDs for easy reference. The tunes are listed according to their number in the table of contents and are also listed alphabetically in the index. As we worked through the tunes, Billy made a list of where he learned each tune. His memory never ceases to amaze me; not only can he remember how all 500 tunes begin, but he can also tell you at which festival and what year he learned each one. An index including information about the place or musician from which he learned the tune is included with the transcriptions. This, combined with a list of musicians who have influenced him, has been a wonderful source of more old-time material to research. 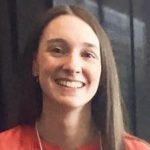 In the two years it took to transcribe the tunes, the Donaghey Scholars Program and my faculty mentors, Dr. Juliana Flinn and Dr. Rolf Groesbeck, provided continual support and valuable perspectives from anthropology and music history. I was awarded a Student Undergraduate Research Fellowship which helped cover the printing costs of the first books and travel expenses, and was honored to present the project at the Student Research and Creative Work Showcase where it received second place in the Social Sciences category. 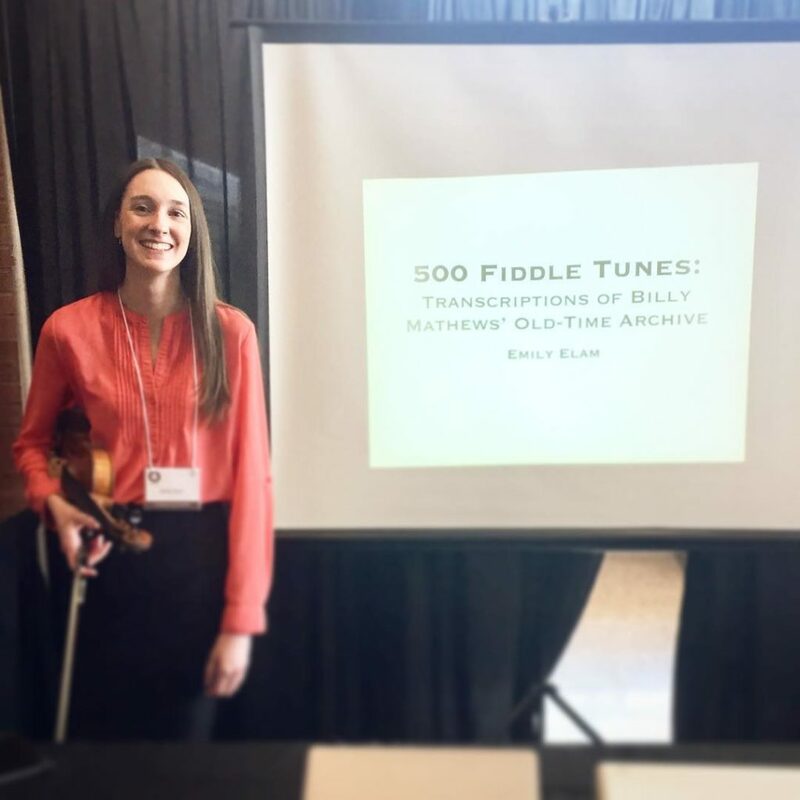 To me, the most important part of the presentations was the sheer number of students and faculty who had never heard of old-time music, but showed great interest – several began taking lessons on fiddle or banjo and have since become a part of the old-time music community. My hope is that these transcriptions of 500 tunes will not just be another tune book, but that they will be a visual aid to those who listen to Billy, that they can help sight-readers learn to play by ear with the accompanying recordings, and above all, that they will be a lasting record of the knowledge Billy has accumulated in over a half-century of collecting and sharing music. 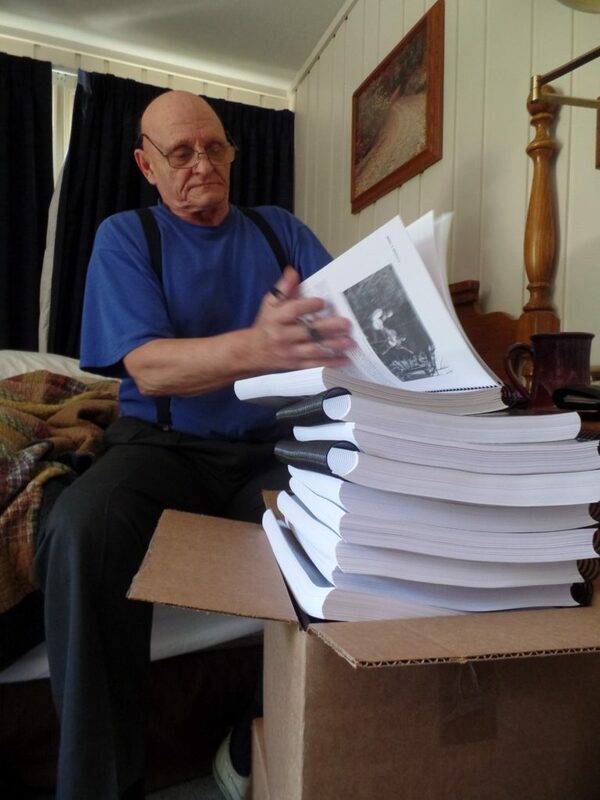 Check out Billy Matthew’s website and find his book here! Are there examples of these transcriptions? A list of tunes? I met Billy at Clifftop twenty some years ago but haven’t seen him in several years. Just interested in the nitty gritty of this project. Dear Uncle John: Help, I’m losing my girlfriend to oldtime! In this column, readers write in to query the oldtime wisdom of Uncle John. You might not always like his answers, but he always gives it to you straight – or crooked, as the situation requires. Write in and read on! Welcome to the home of the global oldtime community. 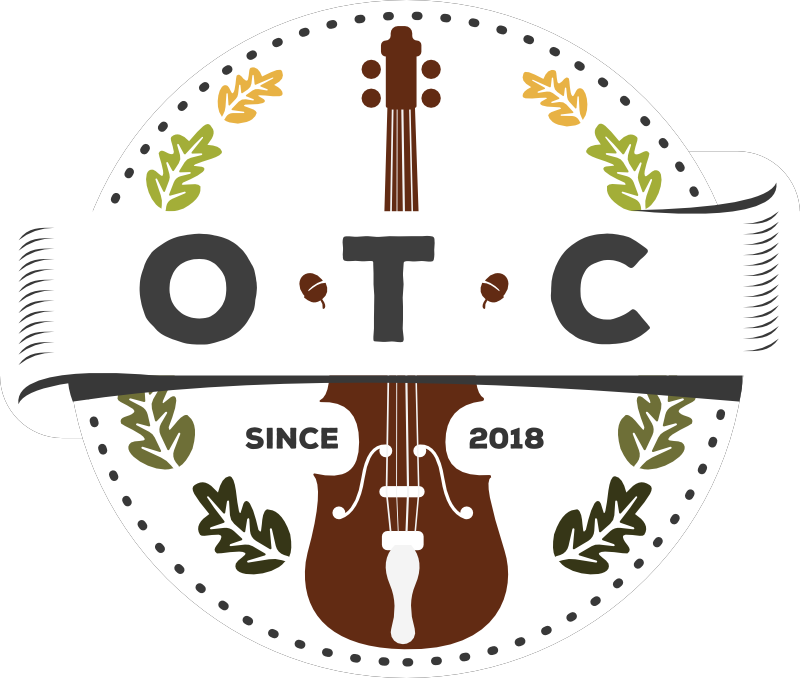 For stories, interviews, videos, articles, entertainment, and more - stay here to check out Oldtime Central!